From the stables of Riese and Muller, next up is our review of the blueLABEL Pony Nuvinci, with belt drive. Started in a garage by Markus Riese and Heiko Muller, this German bicycle company launched their first innovation, the folding full-suspension “Birdy”, back in 1993. In the following years they expanded their range, branching out into mountain and cargo bikes, before dipping their toes into the electric bike world in 2008. 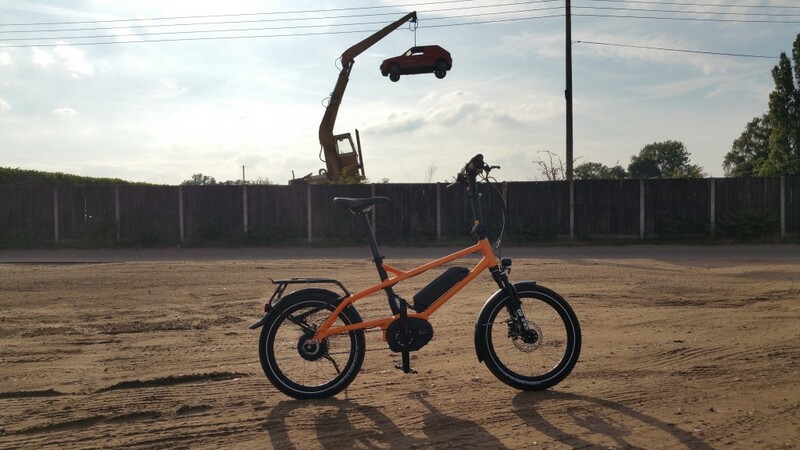 Still selling the Birdy to this day, they now produce a number of electric bikes, including the blueLABEL brand, a stylish and upmarket series of e-bikes. The first thing that strikes you about the Pony is the colour. In a dazzling orange, you’ll definitely stand out from the crowd on this bike! When we picked up the bike from AMPS at the Norfolk Bike Show, visitors were certainly showing a keen interest in the bike. The Pony is an urban bike, multi-functional, ideal for riding to work or for recreation. It shares many similarities with its stable mate, the Charger, upon which it is based. There are three models available in the Pony range, each with a different drivetrain. You can choose between an Alfine hub, the Nuvinci N360 or the Shimano 10-Speed Deore XT; so R&M have pretty much covered all the bases depending upon your preference. If the orange colour scheme is too bright for you, it is also available in white or black. For more details on the blueLABEL Pony specification click here. The Pony can be purchased from AMPS.bike, through one of their dealers or online retailers. If you are buying your bike from a dealer then everything should be set up ready for you. Our fresh out-of-the-box bike needed a few extra things to be done, such as aligning the bars, fitting the pedals, attaching the Bosch Intuvia display mount and positioning/tightening the left brake lever and Bosch remote switch. Walking around the bike, aside from the colour, the first thing that strikes you is how well the Pony has been put together. It just feels like a premium bike. There are nice touches like the cables being ‘inset’ under the crossbar so you can’t see them but they are still accessible. Elsewhere the paint finish is top notch and I like that the seat tube is in black, a contrast to the main frame colour. Everything else feels solid with no loose nuts and bolts. There is nothing flimsy or budget. A key aspect of this bike is that it is marketed as a ‘family bike’ in that it can be easily adjusted for riders of differing height. The angle and height adjustable stem and the very long adjustable seatpost make the Pony suitable for those from around 5ft to 6’5″. To adjust the bike to your height there are a couple of levers on the stem which you need to release. On the side, you then slide back the locking mechanism and ‘click’ the handlebars into the suitable reach. Then lock the levers again. It all feels very solid and secure. Helen: It’s worth pointing out that I’m 5’3″ and struggled to get on/off the bike with the seat at its lowest setting. So if you are close to the minimum height it’s worth seeking one out for a test-ride before purchase just to make sure. 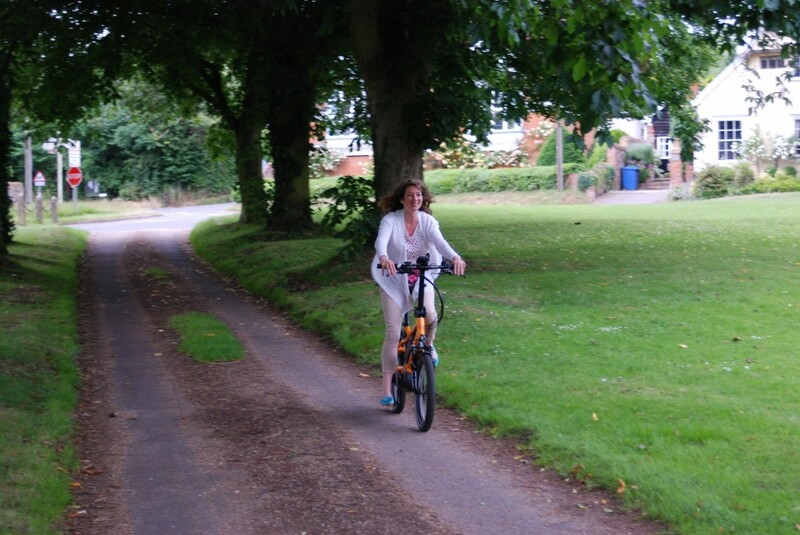 With the battery fully charged, I headed out into my local village. While many Bosch-based city/urban bikes opt for the Active Cruise version, Riese & Müller have fitted the Performance Line motor to this bike. This more powerful motor gives up to 275% assistance and 60Nm compared to 250% and 48Nm of the Active Live. You also get the Bosch PowerPack 400Wh lithium battery. On the road, I couldn’t hear any rattles or squeaks, everything feeling very tight. All you can hear is the Bosch motor whirring away, although this just a gentle hum. This model of the Pony comes with a Gates Carbon Belt drive. There are a number of advantages of this system. There is no oil, they are clean, quiet and resilient. The Gates belt is constructed from continuous loops of carbon cord inside a polyurethane/nylon jacket. The Carbon Drive belt does not stretch over time like a chain and should therefore last between 2-4x the lifespan of a regular chain. This means you don’t have to re-tension the belt, or replace the belt due to stretch. The downsides are that the belt operates at a lot higher tension than a chain resulting in a slightly less efficiency but this is not really noticeable as you have the Bosch Performance Line motor to offset it. It takes a bit more effort to set it up correctly (although you won’t need to do this from new). 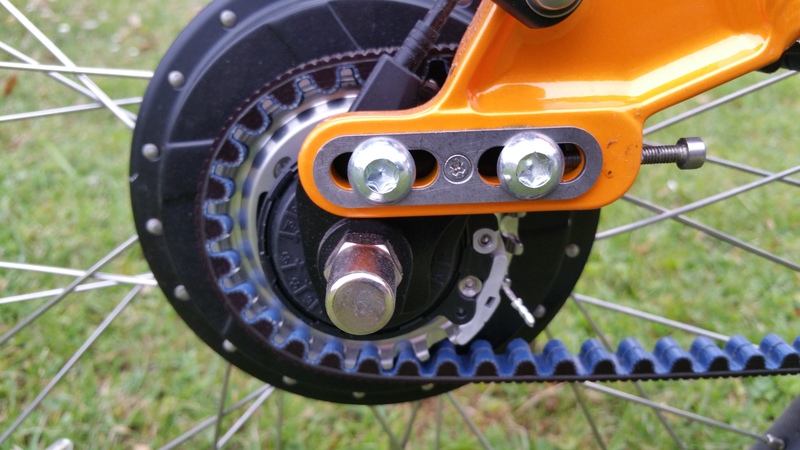 You may have noticed that on normal bikes with a chain, the chain goes through the rear triangle and to remove/attach it you’ll need to pop a link. With the belt drive you can’t do that. To get around this, often the chain stay is ‘cut’ so that you feed a belt through the hole. Obviously this introduces a weak point into the frame. The Pony overcomes this by raising the rear stays so that the chain goes behind and under. Therefore the frame integrity remains intact. 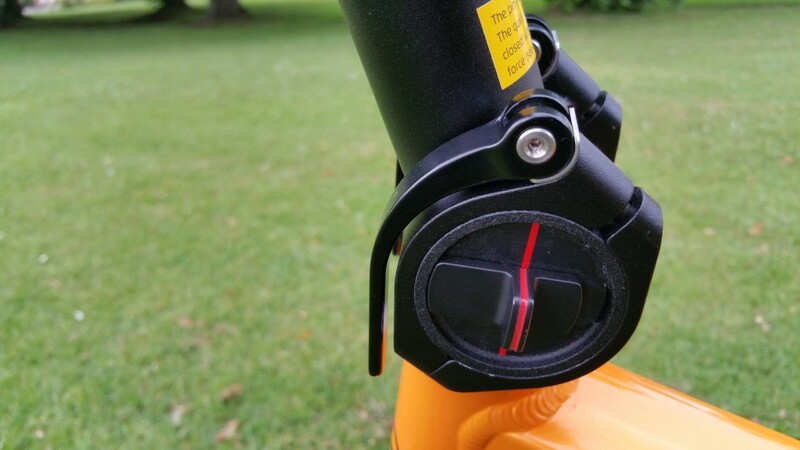 The CDX version belt fitted to this bike also has a small centre ‘ridge’ in it to keep it aligned as well as help to keep the muck out and off your belt. Plus, if you’ve got an iPhone then there is an app you can download onto your phone which will tell you if the tension of your belt drive is correct. You hold the phone’s microphone up against the belt and give it a twang. 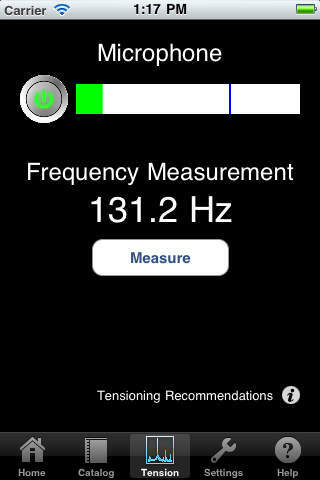 It’ll then analyse the sound and tell you if it needs adjusting! This model of the Pony has the continuously variable transmission Nuvinci N360 hub from Fallbrook technologies. 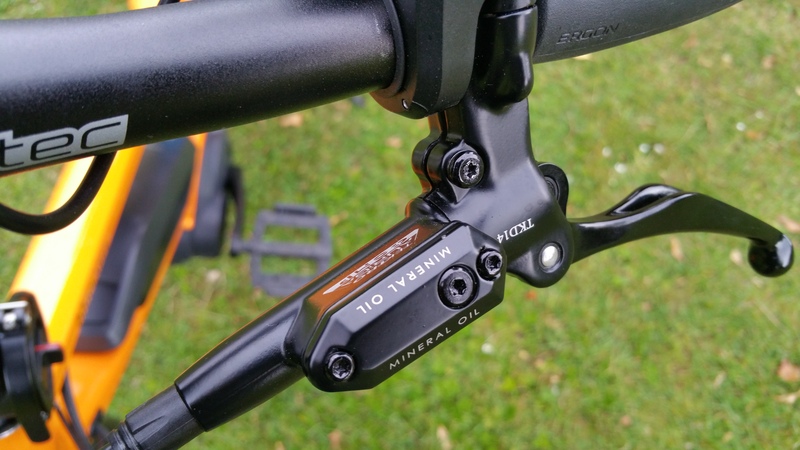 This does away with the normal ranges you get with derailleur gears and instead provides a smooth linear progression, in effect an unlimited number of gears. If you’ve never ridden a bike with one before, it’s a strange feeling at first but you quickly get used to it and while they are no defined ‘steps’ in the gears as you twist the grip, you soon work out how far to twist forward or back to find your comfort zone. The hub system is heavier than a normal derailleur set up but it’s not something you’ll notice on this type of bike. Is it as efficient as a chain? Reports are that it is not, but hey you’re on an electric bike so that difference is likely to be negligable in normal daily use. The Nuvinci comes with its own twister that sits next to the right hand grip. As you twist it, the shifter display indicates the current gear ratio as a hill for slower speeds and a flat road for faster speeds. It’s a bit of a novelty at first, but after a short while riding the bike I never looked at it again, just going by feel alone. Being able to change gear at a standstill is also a huge benefit, especially if you have to stop quickly and then restart again. Bear in mind it will only shift about halfway through its range at this point however. Once you start moving again then you can shift through the rest of the range. For portability, folding the handlebars/stem down flat means it is a bit easier to get the bike into a car, although unless you’ve got a particularly long boot you’ll need to fold a seat down. At nearly 24Kg though, you won’t want to lug this bike up the stairs. Braking is provided by Tektro Auriga hydraulic disc brakes front and rear. These brakes have a good progressive feel with plenty of response and you know they can stop you quickly if you need to. For the unpredictable UK weather, there are a decent pair of mudguards. Unfortunately during my week of testing we barely had a shower (highly unusual for the UK I know!) so I wasn’t able to put them to the test. However the mudguards are long enough to protect the motor and your legs. 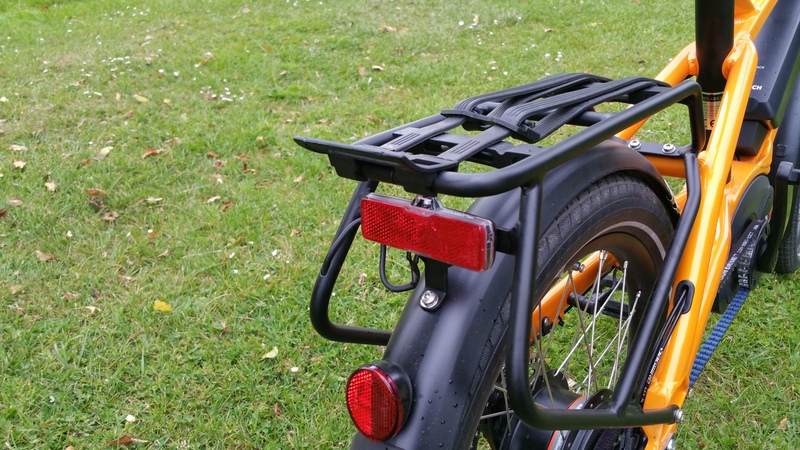 For commuting, or transporting the shopping, there is rear rack with elasticated strap which feels very solid. 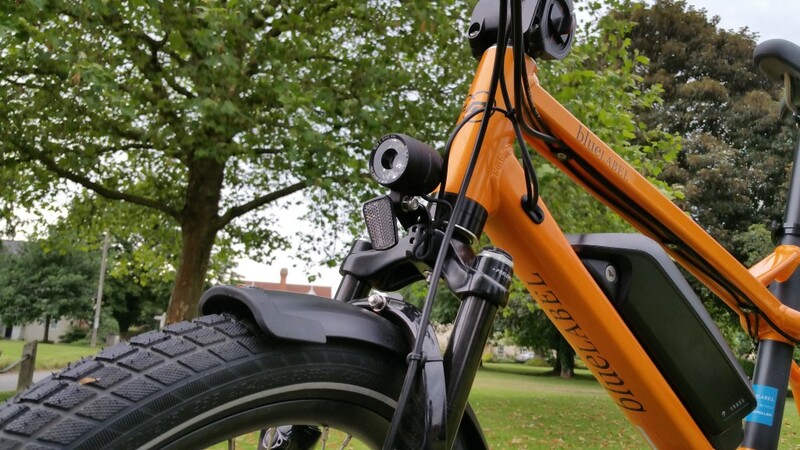 And for those short winter days and long winter nights, a compact Supernova E3 E-Bike V6s LED light is provided out front and a Busch & Muller Toplight mini on the rear. The matt-black front light is powered by a CREE LED, putting out 165 lumens. There are no flashing modes, just on/off. The lights are controlled by the ‘light’ button on the Intuvia console so easy and accessible and both are powered directly by the Bosch battery. 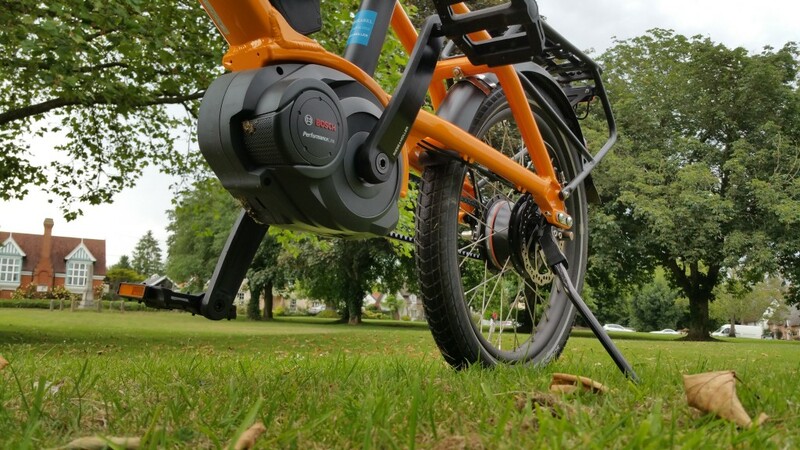 Should you somehow end up depleting the battery completely on one of your rides, the Bosch PowerPack should give you up to another 2 hours illumination. Taking the bike out late one evening to an unlit lane, the V6s has plenty of throw with a faint hotspot, enabling you to see potholes and other obstacles. 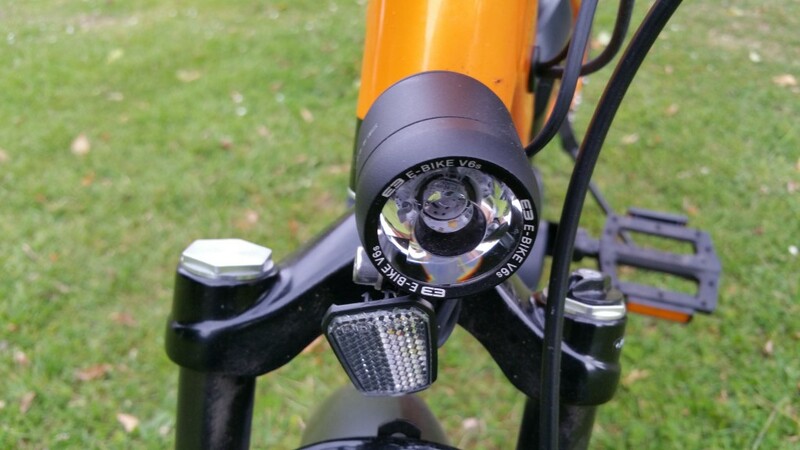 It’s good to see decent lights fitted as standard – although obviously you are still paying for them – particularly useful if you commute on unlit country roads. LED lights have come on tremendously in the last few years. For the derrière I found the Selle Royal Freccia Lookin saddle to be very comfortable and even on the long rides, I didn’t feel the need to get off the seat for a while. At the other end, the Ergotec handlebars were very comfortable with the grips providing plenty of support for the palm of your hands. The 20″ wheels are fitted with Schwalbe Big Ben tyres which are great tyres for job. I’ve been using Schwable tyres for years and have never had a problem with them. They roll very well on the Pony, soaking up all the bumps and potholes. With a slightly taller tread for better grip off-road, through the fields and trails they provided plenty of grip so no complaints there. Finally, in terms of backup there is a 5 year warranty on the frame and 2 years on everything else. Being a brand new bike with less than a mile on the clock the Intuvia console was reporting a predicted range of 11 miles on the ‘Turbo’ setting which is clearly much less than what it is capable of. I attached a Garmin 200 with GPS to keep track of my speed and distance. Riding conditions were dry with a fairly brisk breeze. With 5 full bars showing on the battery level, I headed off on a largely flat route keeping the bike at around its maximum assisted speed. The Intuvia display was reporting around 16.2mph and my Garmin GPS 15.9mph so it is within the tolerance allowed by law. When the empty ‘flashing’ light appeared I had about 500m before the assistance stopped completely. Total distance travelled was 32 miles. This was on a open and flat route with a fairly strong breeze. As with all reviews, these figures are only representative of my riding style, weight, fitness etc. Average speed for the trip the course was spot on the legal limit at 15.5mph. Having done a range test using maximum power and speed, I repeated the test using the “Eco” mode setting and aiming for a more leisurely pace of around 10 mph. Starting out with a fully charged battery, the reported range from the console was 75 miles. Again, my chosen route was pretty flat. 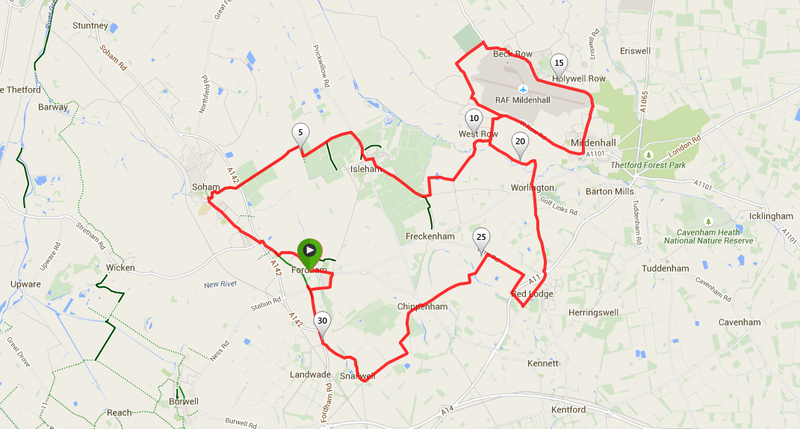 According to my GPS my average speed was acutally 11.8 mph. Wind conditions were very light, practically no wind at all. Sunny, warm 25+ degrees. Total change in elevation gain only 103 feet. Returning to my nearest hill-test route, the combination of 20″ wheels and the Bosch Performance motor meant that the bike was not going to have any difficulty climbing the hill at Hartest. At around 17% at its steepest gradient, I was able to power up the hill with ease. First time, climbing as quickly as possible using the Turbo mode as well as much of my legs as possible, my average speed was 13.8 mph. Going up the hill slowly was easy with the Nuvinci hub and Performance Line motor. The hill is not a linear climb so there are a couple of sections that are steeper than the others. The Nuvinci made it easy to make small/minor adjustments so I could maintain my cadence. On the way back down the hill, it’s easy to hit over 40mph without much pedalling. There is a gravelly bend about 2/3rds the way down which I didn’t feel comfortable taking at over 30mph on the Pony. 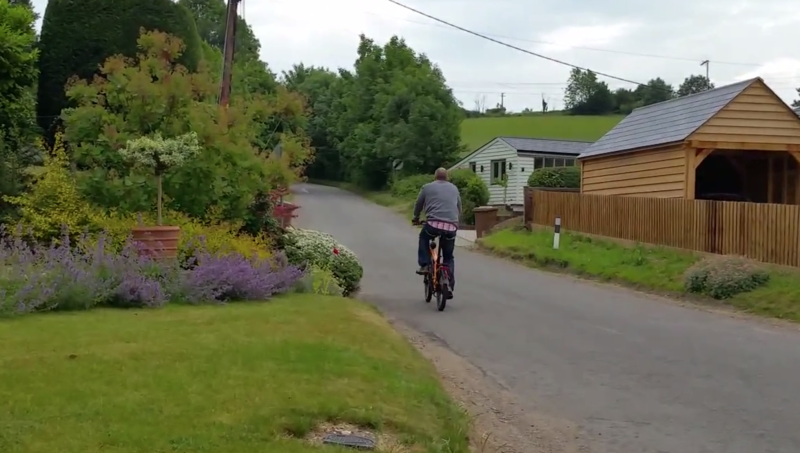 The bike’s responsiveness and manoeuvrability at low speed didn’t translate into high speed. But this isn’t a bike you’re buying to ride around at those kinds of speeds anyway. Helen: Riding the Pony in and around traffic was pretty effortless. The bike is quite zippy with the Performance motor and was quick off the mark at traffic lights. I did manage to snag the bottom of my trousers a couple of times in the front chainwheel, but at least there is no oil to get them dirty! Adding the Performance Line motor to the Pony, Riese & Muller definitely intend you to use it. This isn’t a bike to scrimp on the power and ride around on Eco, it’s nippy and responsive combined with swift acceleration means it’s designed to get you from A to B quickly. It’s fun! The chunky tyres soaked up the bumps and potholes. The Pony is very easy to ride, nippy and child’s play to manoeuvre around town. 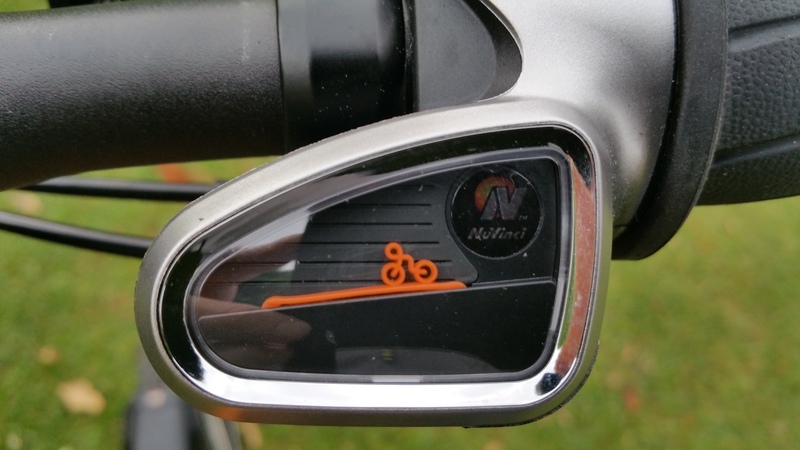 We both like the striking orange finish, the Nuvinci gears add to the ‘easy to use’ checklist, meaning you can just enjoy your ride without worrying you’re in the wrong gear if you have to stop suddenly in traffic. It feels expensive the moment you hop on, and the spec lives up to that initial assessment. Should you buy one ? I had lots of fun riding the Pony. 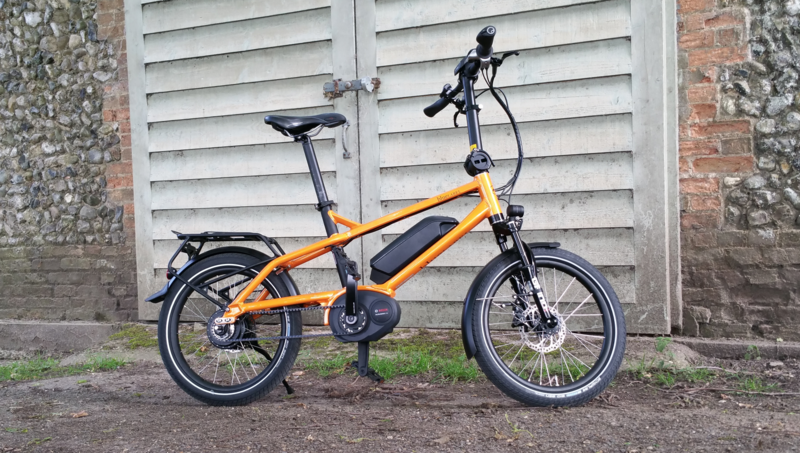 It’s not cheap at nearly £3K but if you’re after a quality electric bike that will last for years then you should definitely try one. The fact that it can suit riders of differing heights adds some flexibility if you want to share the bike with more than one member of the family. There are decent components, a great paint finish and attention to detail. The Performance motor, belt drive and Nuvinci add up to a great combination for city/recreational riding. If you’re a commuter, then there is no oily chains to mess up your trousers or skirt. The Nuvinci is great for lots of stop/start traffic. All in all, there isn’t really anything to criticise. But then, at this price point there shouldn’t be! If you have the budget to splash out and your shopping list has tickboxes for comfort, quality, town and village use, this might be just the ticket for you. If you like the spec and the brand, but want a larger frame and wheels, then you should take a look at the blueLABEL Charger, which is the subject of our next review. Our thanks to David at AMPS.bike for sending us this bike to review. You can view some more photos taken during our test here – blueLABEL Pony Media.